I’ve never liked games that tried to substitute one piece for another: “use X to represent Y.” I know many aren’t bothered by this; game designers turn them in to us all the time. If the Waffen SS can be lovingly presented in black with silver trim, then Canadians can get their maple leaf and South Africans their antelope head. And for Africa Orientale Italiana, we have some lovely antelope heads. The South African Army did not pile up nearly as impressive a combat record as those of the other Dominions — Australia, New Zealand, Canada or India. Two divisions and many smaller units went to the front in North Africa. One division suffered grievous losses during Operation Crusader in November, 1941, and seven months later all of the other would be lost with the surrender of Tobruk. 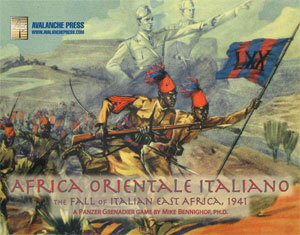 Africa Orientale Italiana features 88 South African pieces; they feature in nine of the game’s 40 scenarios. Here’s a look at the South African pieces included. South Africa’s forces were organized on the British model, with four companies per battalion (rather than the three companies common in most other armies of World War Two). Each company had three platoons, but the companies were much smaller than those of their adversaries (124 men in a British company against 190 in the German 1939 organization) with platoons about 3/4 the size of those of other nations. This has always frustrated Panzer Grenadier players from Britain, Australia and other such places, who wonder why their troops have the same firepower as the scorned Italians or Romanians. The Tommies and Diggers are generating their 4 factors with about three dozen guys against 45 or so of the Good Soldier Guido’s comrades. Not all armies deployed motorcycle troops as a combat arm; we’ve portrayed German, Italian and Romanian ones previously. South Africa was one of the few Allied powers to organize them, sending two companies to East Africa with the intention of using them in traditional cavalry roles in the broken ground of southern Ethiopia. Recruited exclusively from South African traffic cops (who even brought their police motorcycles to the front), the motorcycle companies failed pretty miserably. Lacking the long training needed by military scouts, what information they did bring back proved nearly useless, their machines broke down constantly, and they showed a decided aversion to combat. Fighting the tough Somali dubat irregulars proved far different than ticketing speeders back home. The South Africans would have done far better by sending traditional horsed cavalry to Ethiopia; until early 1940, they’d maintained a Mounted Commando Division. But that would not be “modern,” and no South African horsemen entered a combat zone. South African troops carried standard British-issue weapons: the 2-pounder anti-tank gun and 3-inch mortar. The British mortar was decidedly inferior to the French-designed Brandt 81mm mortar wielded by just about every other army on the planet; the 2-pounder just as useless as the 37mm gun dragged along by the Germans and much less useful than the Italian Army’s Austrian-designed 47mm, which unlike the British weapon could fire high-explosive shells. The Swedish-designed 40mm gun anti-aircraft gun was popular with South Africa’s generals, and they attached more batteries to their divisions than did other Commonwealth armies. As in other armies of 1939 vintage, most of South Africa’s generals came out of the artillery branch thanks to extensive experience during the Great War. It was not by their choice that much of their army’s artillery also dated from 1918. Where British and other Empire artillery regiments used the excellent 25-pounder as their medium piece and the very good 4.5-inch howitzer as their heavier artillery, the South Africans went to war in Kenya with many batteries still equipped with the older 18-pounder medium gun and the quite aged 60-pounder heavy piece. By the time the South African divisions moved to Egypt most but not all of the 18-pounders had been replaced by 25-pounders, but the Springboks retained their old pieces and re-assigned them to anti-tank batteries where they could do more damage to Axis tanks than could the useless 2-pounder. Unfortunately they had been designed for the immobile warfare of 1914-1918 and were difficult to move quickly. As befitted a rapidly developing frontier society, the South African Army was entranced by tanks and other new devices and desperately wanted them for its divisions. Even before the war, a South African Armoured Corps had been established, but in September 1939 it still only possessed a handful of training vehicles. When troops were dispatched to East Africa in late 1940, the best of these were gathered together to form the 1st South African Light Tank Company. Equipped with Vickers Mark II tanks, the company came close to combat with an Italian tank company on several occasions but the armored clash for Somaliland never took place — probably a good thing for the South Africans, as they had no armor-piercing weapons on their tanks. Soon after their troops began to arrive in Egypt, the South African general staff suggested converting both infantry divisions into armored formations. Both government and army lobbied hard for this move, which provided one of the first major rifts between the South Africans and the British command. The British refused, and several staff officers made pointed comments about “wasting” resources on divisions that were not allowed by their government to leave the African continent. A number of South Africans transferred to British Army tank units. Some sources claim that some of the Valentine tanks that assisted in the assault on Bardia were “South African,” but this seems an exaggeration — South African crews were present and the overall command was South African, but the tank units were on the British establishment. We included a few pieces anyway, but South African tank units would not appear in earnest until 6th South African Armoured Division entered combat in Italy. South African armoured car regiments operated both with the two South African divisions and as independent formations; one of them saw action with 7th Armoured Division during Operation Crusader. They had an excellent reputation, unlike the South African infantry. British and Australian units also made use of the South African-made armored cars. During the Great War, the South African Brigade compiled an outstanding record on the Western Front and was called the finest of all the Dominion forces. South African forces did not do nearly so well a generation later, and the fault seems to lie with their leadership. South Africa had been a prosperous primary producer, its economy built on its incredible natural wealth. The Great Depression hurt terribly — sectors in which the Boer population had strong holdings were devastated as wool prices, for example, dropped 75 percent. Those in which English-speakers dominated, like gold mining, held their own or expanded. Seeking cheaper labor, mine owners and industrialists recruited black labor for the first time on a large scale, and Boer resentment flared. By the 1940s, many in the Boer community despised the English. While only a lunatic fringe actively supported Adolf Hitler, a sizable minority of Boers preferred to see their country sit out the war in neutral status. Within the officer corps, many English-speakers showed themselves uncomfortable with Boer racism while Afrikaans speakers displayed open contempt for uitlanders. This social tension spilled over to hamstring the effectiveness of South African officers, who often seemed more hostile to the British high command than to the Axis. In the game, South Africa’s leaders include some very good ones, but overall the quality is slightly less than that of the British leaders in Africa Orientale Italiana. A subtle and often unnoticed aspect of Panzer Grenadier scenario design is that we reflect the quality of unit and unit leadership not only through the number of leaders provided, but the mix of ranks. A good-quality, cohesive unit has a "pyramid" spread of leaders by rank, to more easily enable “chain” activations. One with less cohesion might have the same number of leaders, but they are clustered at the low end of the scale: One colonel, one major, one captain and three lieutenants are more valuable than one colonel and five lieutenants. The South Africans have a reasonable spread, much better than an Italian colonial unit, but not as good as the Indians or Savoy Grenadiers seen in the Eritrea scenarios. Mike Bennighof is president of Avalanche Press and holds a doctorate in history from Emory University. A Fulbright Scholar and award-winning journalist, he has published over 100 books, games and articles on historical subjects. He lives in Birmingham, Alabama with his wife, three children and his dog, Leopold. Leopold has a very fine nose.